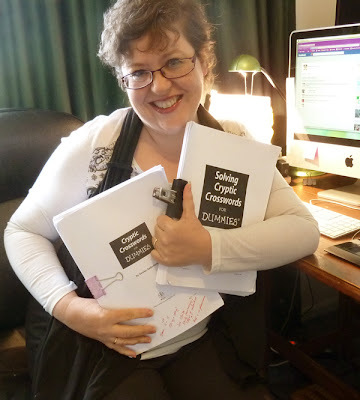 Solving Cryptic Crosswords For Dummies (the in-depth 'how to' book, with 16 full crosswords) and Cryptic Crosswords For Dummies (a companion volume, with 56 crosswords) are FINALLY DONE! The books will be out in Australia, the UK, and the USA in August this year. My god, what an effort ... I started work in the middle of last December, so both books were written in just over 4 months. In the past 6 days I've solved and edited every single one of the clues in the second book (about 1,500 of the little toads). I don't have to work on weekends or evenings now ... it'll take a bit of getting used to! Congratulations, that's a whole lot of work and you look so Happy!! !